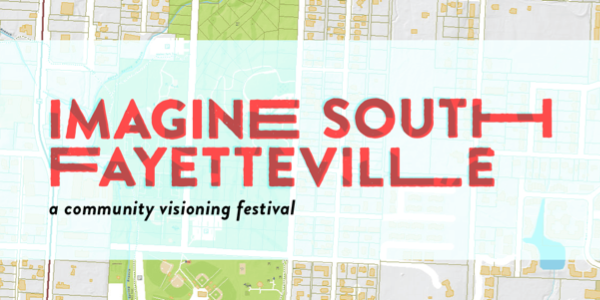 Imagine South Fayetteville is a 3-day arts-integrated community visioning festival to discuss issues directly impacting residents and envision a future South Fayetteville that is equitable for the people who live there, who have always lived there, and will live there. This festival, organized by The Artist’s Laboratory Theatre, is in collaboration with the City of Fayetteville and made possible by grants from the National Endowment for the Arts and Walmart Foundation. The following events are free and open to the public! Modus Studio will produce a PechaKucha themed around community-based solutions to community issues. Speakers include Fayetteville leaders, artists, and educators. An Ozark Regional Transit bus tour of tactical urban projects from the community challenge “Hands On, South Fayetteville”. This part of the festival includes a workshop performance of The Camp as part of Good Person of South Fayetteville, an upcoming Artist’s Laboratory Theatre play about housing insecurity and community accountability. Seats are limited - get your tickets below! A panel discussion featuring national experts on equitable community revitalization that benefits local residents, preserves local culture, and prevents displacement.